You can almost feel the electricity of excitement as they enter the Harvest or Halloween party area that you’ve prepared. Whether they’re in first grade or fifth, they bolt in with wide eyes, darting from corner to corner, to see what decorations, games and treats you’ve brought for them. It’s Halloween party time! With thirteen years of classroom party coordinating, I am no expert. I still scramble to email other creative friends for fresh ideas, or search the web for easy and fun games. What did we ever do without Pinterest? What I do know is that the kids just want it to feel like a Halloween party and not like a classroom. In my opinion, the best parties include getting the kids out of their seats and onto the floor, into a hallway, gym, or better yet, outside the school building! As a general rule of thumb, if it requires a long list of instructions on exactly “how” to have fun, it’s not very fun. Just keep it simple. Below are a few common and successful party games. Most are relays and require you to divide students into groups or teams. Before the game starts draw ghost faces on the marshmallows. Race to see how many “ghosts” they can stack before their tower falls. Divide into pairs. Wrap your partner like a mummy during this timed race. The kids like to wrap their teacher up as a mummy too! In advance draw bloodshot eyeballs on the ping pong balls. Place eyeball on the spoon and race to other end. Pass the spoon to a teammate who races back, or they can drop the “eye” into a plastic pumpkin or freshly carved pumpkin and race back. The students must race to get dressed up and then race to the other end, remove costume items and tag teammate. Try to gather funny items that are similar for two teams, like a hat for each team, 2 wigs, glasses or mask, vests or jackets, skirts/tutus, capes etc. The sillier they look, the more fun they will have. Each student blows up their balloon and decorates their monster. Tie one end of string onto balloon and other end to shoe or ankle. When the game begins, each student needs to try to step on or sit on someone’s balloon monster, while protecting their own (without hiding it or holding it). Whoever survives the “monster mashing” moves onto the final round. Best if done in smaller groups to avoid chaos and to allow kids to watch this crazy activity. Don’t assume they’re too old for games. If you bring it, they will make it, play it and eat it. Even the kids who think they’re “too cool for school” will enjoy the break. 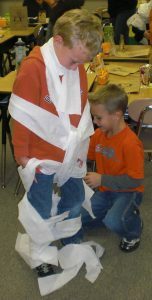 What are YOUR favorite games, treats, music and decorations for a classroom Halloween party? I’m still looking for those fresh ideas!